Of all the things I thought would be discussed in a radiotherapy treatment room, Star Wars was not one of them. 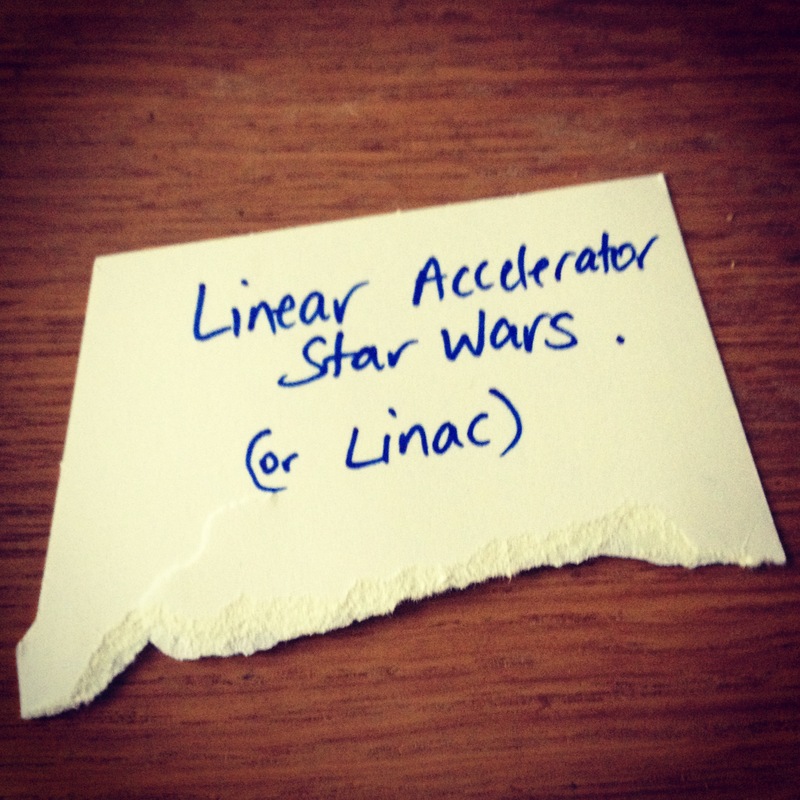 Today, however, after a bit of banter about how difficult it is to describe the experience of going through a blasting, one of the ladies handed me a piece of paper with the following words on it: ‘Linear accelerator Star Wars (or LINAC)’. For those unacquainted with a radiotherapy room (you lucky things), this Star Wars figurine is sat on a linear accelerator (or LINAC), which is the device most commonly used for external beam radiation treatments. I love the fact he’s zapping planet tumour with his red laser beams! 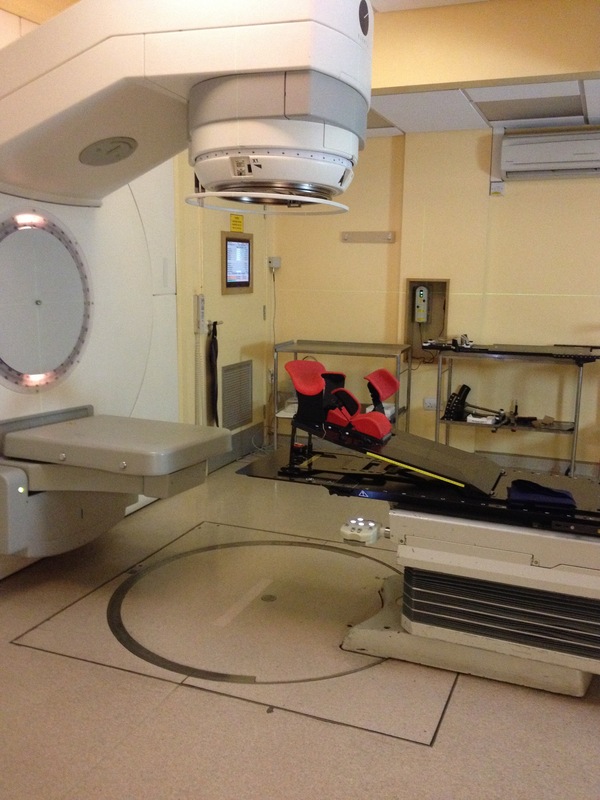 Ok, so while not quite as futuristic as a Star Wars movie, I think it demonstrates the fact radiotherapy is quite unlike another other form of medical treatment. It also demonstrates that, even in a 15-minute appointment, there is always room for a bit of banter. Even without the ‘force’ on my side, today’s blasting was so much more relaxing. No tapes, no wires, just one felt-tip pen mark and a lot more laughter. (Apparently the appointments get quicker as they become more confident with the positioning. I will move to weekly photos after day 3 if everything is still ok.) I was also in and out of the hospital within 25 minutes flat, which is certainly a new personal best in terms of appointments. There was even time for a photo or two given things were running to time. 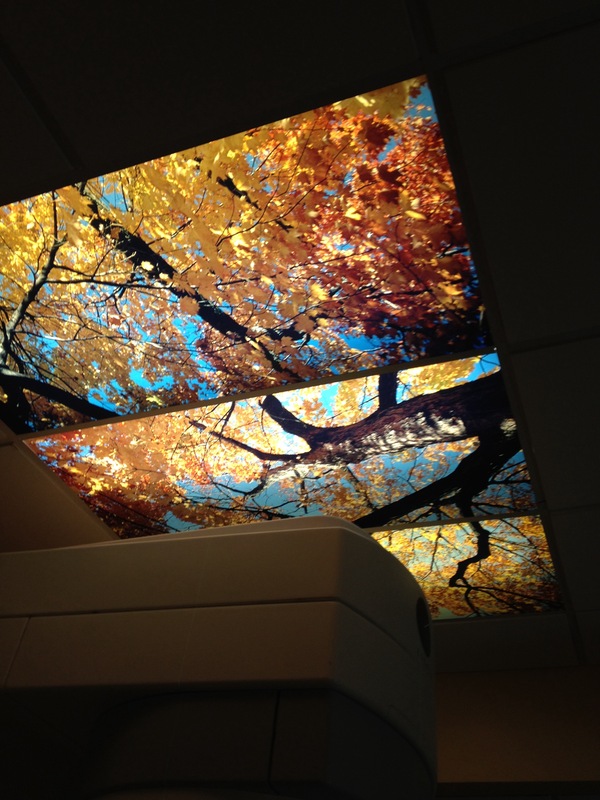 And this is the autumnal forest scene designed to distract me from the ceiling tiles (Elekta 1 doesn’t have such a scene). I am so glad it was there, because I spent most of the treatment suppressing the urge to wriggle about (why is it when you are forced to lie still you are so tempted to move?). It also distracted me from the fact that every time I took a breath, I could see the green laser moving. I decided it might be best to hold my breath, but that wasn’t particularly fun. I then decided that I think way too much when left alone in a room with a high-tech piece of medical equipment. It would be far better for me to imagine myself walking among the autumn leaves, which I think is the idea. It’s back to the ceiling tiles for tomorrow’s blast. I can do without the autumn leaves, but now have high expectations for the level of banter now possible. If you have a burning question about radio (or other interesting radiotherapy-related You Tube clips) please post here. Happy to ask away.